Okay, excuse me for a minute whilst I channel my inner hippie. I would like to discuss homemade sprouts with you all. Sprouts (alfalfa, bean, wheat, etc.) are one of those things that one either gravitates toward in a salad bar, or one avoids. “Weren’t there some salmonella poisonings connected with the things,” the paranoid within you asks. Yes, there were. Yet another reason to D.I.Y., I think. This home-produced diet of ours is a bit weak on greens, greenhouse stuff included. It’s one of the reasons I am angling for a second greenhouse. And yes, we have lots of frozen goodies put up from last summer’s harvest: I do think we have plenty of green beans and broccoli to get us through until asparagus season. But one hankers for the fresh stuff, especially when I am really stingy with the greenhouse goodies. A trip into your pantry or cupboard will probably reveal that you have stuff just right for sprouting. (In fact, it is to your cupboard you should go, and not to your garden seed stash: many garden seeds are treated with lots of nasties like antifungal spray.) A trip to MY pantry is what set me on this course, frankly: I noted I had only a tiny bit of mung beans (too few to cook) and that I also had some old (pushing two years) wheat berries. So, I thought: what could I possibly do with these things? Er, well. 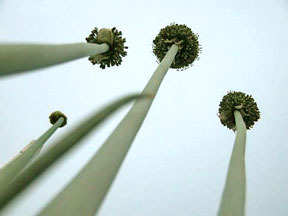 Why not satisfy that greenery lust of mine and sprout them. The process takes about 5-6 days in our cold house. (In a warmer one, it’ll take less time.) You start by cleaning and rinsing the seeds, then setting them out overnight covered with nice, clean water in a nice, clean bowl. The next morning, you dump the water off, rinse the seeds and drain them again, and transfer them to a clean jar. You cover the mouth of the jar with cheesecloth, and you set the jar on its side, spreading the somewhat damp seeds out. That evening, you put more water in the jar and gently shake to rinse the seeds out. Drain the water, and repeat this process, morning and evening, until the things sprout and look all happy and delectable. Let them spend their last day greening up near a sunny window, being careful not to dry them out. Okay. These lovelies are destined for a loaf of bread (the sprouted wheat) and a big salad (the beans, in about a day…they need to keep sprouting). You can puree things like garbanzo sprouts into a spread. Slightly sprouted wheat berries can be added to bread dough for a chewy loaf (just add them right before you form the loaf; any earlier affects rising). And of course they are just great in salads. If you get into the habit of it, you can get a second batch going two-three days after the first to keep yourself stocked up. They’re great sources of some needed vitamins, like C and B, and the bean sprouts are good protein. Plus, it’ll help your latent need to garden in these cold months! This entry was posted in food, seeds. Bookmark the permalink. I’d be interested in a discussion about using the sprouted wheat in a loaf of bread. Price talks about that, but I’ve never taken the time to figure out how to do it. Perhaps you could discuss that also? I also sprout! My favorites are zesty sprouts such as onions and radishes. I sneak them into everything. For sprouted wheat, you can just toss a handful into your regular bread recipe to add some texture and crunch. Thanks for the how-to. We have some alfalfa, but the directions on the bag aren’t too clear. Now I know! Our local hippie organic grocery store sells sprouting lids for jars, so that is going on the shopping list. Matt: What Robin said! It’s pretty simple. I add it after the punchdown of the first rise: right before I make the dough into loaves, I flatten out the dough and spread the sprouts out evenly. then I give it a few kneads (so I don’t have a swirl of sprouts once I form the loaves) and then I make the loaves, let them rise, etc. It’s best to add them at this phase than when you first your dry ingredients together. It messes with the yeast rising process (trust me here). Robin! HI! I am so glad I am not sprouting alone. Onions, huh? Hmm. Must try. Must find source first that is not my garden stash. Meg: Glad to oblige. Sprouting lids? Well, I guess not everyone has cheesecloth just lying around their kitchens! I’ll have to look into that, too; the cheesecloth gets pretty grody after a couple of sprouting sessions. A jar of sprouts – this I can do! I have some old mung beans that will be perfect and the whole process will feed my inner gardener. Thanks El. 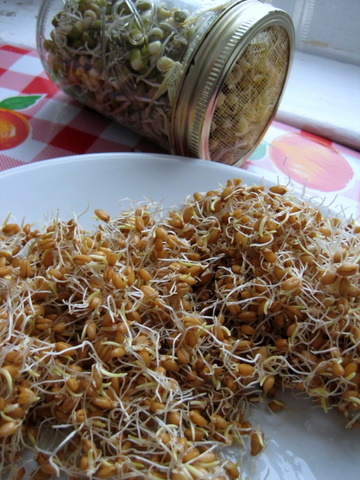 I LOVE sprouts – especially different kinds of grain, bean, pea sprouts all mixed. Sometimes make bean soup from them, just waiting until they’ve broken through the seed coat and not yet leafed out. Lentil sprouts are a real favorite – recently made them into yummy fritters.